In a comment on my reflection on leisure, Thomas Worthington mentioned the story of Solon and Crœsus. Crœsus had asked Solon who the happiest person was, and Solon’s answers focused on people who had died admirable deaths. The idea is that you can’t say people are happy or blessed person until they die, since their luck could always go bad. It got me thinking about the differences between how I think of happiness and how I think they thought of happiness. 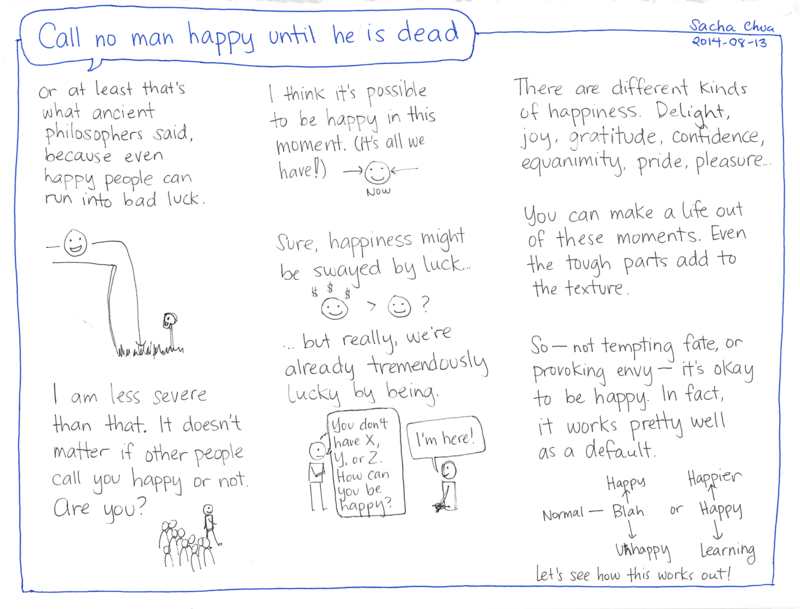 I can see the point of those ancient philosophers, but it seems unnecessary to focus on what people would judge as happy. For me, it’s much more useful and more real to be able to think of myself as happy, and to keep in mind that the ups and downs of fortune are small waves in a very deep lake. It’s like Louis CK’s rant, Everything’s amazing and nobody’s happy. I’m writing this on a computer and the text will be sent off through radio signals and electrons and photos around the world! And I have windows and indoor plumbing and all these other luxuries beyond those enjoyed by ancient kings. But this kind of happiness comes easy to me, at least at this moment. We’ve learned a lot about how the mind works, but not enough – there are things that can take away your ability to appreciate and enjoy and hope. (Note to future Sacha: if this happens to you, remember that things will work out.) In the meantime, giving myself permission to be happy–not a tempting-fate sort of happy, just an appreciative sort of happy–makes it easier for me to enjoy life. People have different ideas about happiness. Some people think happiness requires wealth, fame, pleasure, freedom. I doubt there’s much point in trying to change someone’s mind about happiness or get them to agree with you on your definition; and even your definition might change over time, as you learn from other people. Live your own life as well as you can. Perhaps by illuminating those possibilities, you might help other people explore their own.